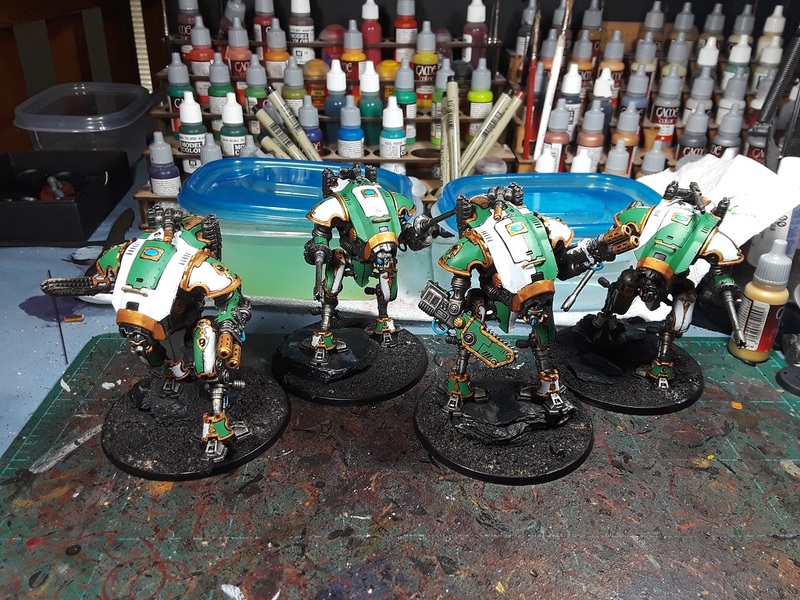 Mordian 7th Regiment: Dreadtober 2018 - House Vyronii Armigers livery on! Dreadtober 2018 - House Vyronii Armigers livery on! Dreadtober is upon us, which means it's time to paint some giant stompy death machines! 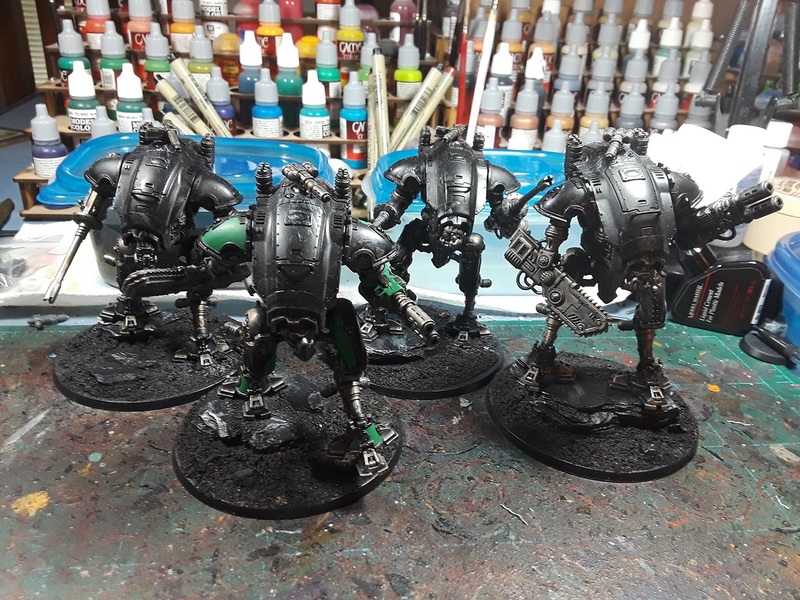 None of my current Heresy projects include any dreadnoughts so instead I'm working up a quartet of Armigers to mill about the feet of the Knight Lancer I'd done a few months back. It's been a rough week recently so I've been remiss on getting stuff posted and updated on the Dreadtober page but the always awesome Todd Sherman has been keeping a hand on the rudder. Big thanks to him for keeping the ball rolling in my absence! To begin with all the metal areas were given a pass with Vallejo Gunmetal, drybrushed with Chainmail, then given an Army Painter Strong Tone wash, which gives it an oily, dirty metal look. Next up was blocking in the House Vyronii livery, which is an emerald green and white. I didn't want to paint each one identically, so they each got a bit of a half-and-half pattern that ties them together color-wise but keeps them individualist which I think suits the knightly order vibe. Next up was the gold trim and cleanup of the areas where the livery got out of hand. They're starting to come together nicely! Now on to all the fiddly detail work and basing prior to the initial sealant pass step. Once that's done I can do the waterslides and weathering - So far, so good! 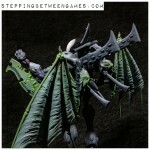 Nice, I would love to see you orkify some armigers! Sweet! Great progress so far. Congrats with taking on four "dreadnought sized" models for the challenge. Bets of luck! Cheers! They've been pretty quick so far, batch painting ahoy! Painting Servitor. 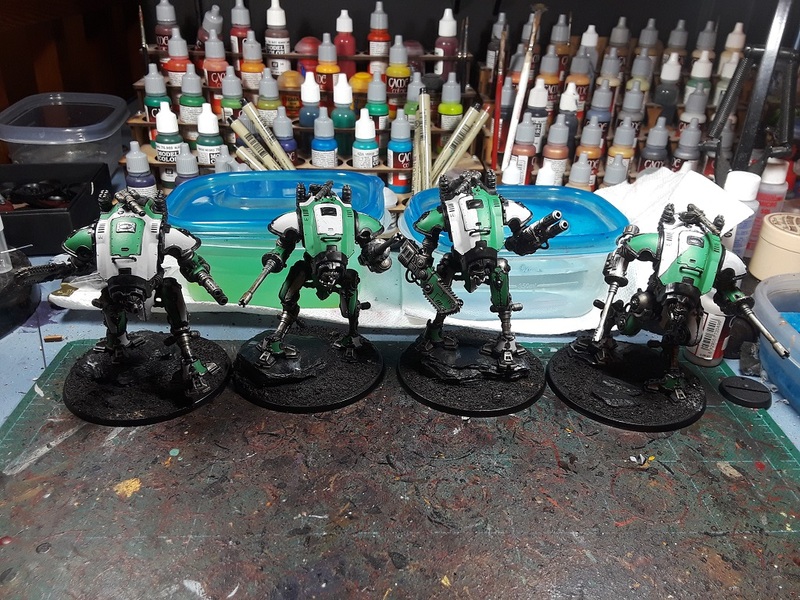 Lol, great progress on Four Dreadtober models! Effective scheme mate. Good work. Thanks man! I had to get away from the usual Red/Black/White scheme of the Mechanicum! I like the variations in heraldry. Very good. Thanks! That's definitely the most evocative thing about the Knight houses for me, really pushing the variations on heraldry. Thanks, bud! They've been a hoot! Heresy Era Word Bearers - Argel Tal built!